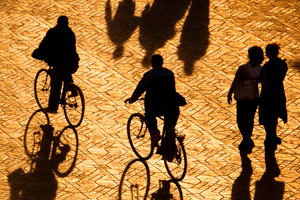 Many Muslims express concern about religious extremist groups operating in their country. On balance, more Muslims are concerned about Islamic than Christian extremist groups. And while the vast majority of Muslims in most countries say suicide bombing is rarely or never justified to defend Islam against its enemies, substantial minorities in a few countries consider such violence justifiable in at least some circumstances. In 31 of the 37 countries where the question was asked at least half of Muslims believe a democratic government, rather than a leader with a strong hand, is best able to address their country’s problems. Support for democracy tends to be highest among Muslims in sub-Saharan Africa and Southeast Asia. In 12 of the 16 countries surveyed in sub-Saharan Africa, roughly two-thirds or more prefer a democratic government, including nearly nine-in-ten (87%) in Ghana. Fewer, though still a majority, prefer democracy over a strong leader in Guinea Bissau (61%), Niger (57%) and Tanzania (57%). In Southeast Asia, more than six-in-ten Muslims in Malaysia (67%), Thailand (64%) and Indonesia (61%) also prefer democracy. In the Middle East and North Africa, at least three-quarters of Muslims support democracy in Lebanon (81%) and Tunisia (75%). At least half in Egypt (55%), the Palestinian territories (55%) and Iraq (54%) do so as well. Attitudes vary somewhat in the other regions surveyed. In South Asia, the percentage of Muslims who say a democratic government is better able to solve their country’s problems ranges from 70% in Bangladesh to 29% in Pakistan. In Central Asia, at least half of Muslims in Tajikistan (76%), Turkey (67%), Kazakhstan (52%) and Azerbaijan (51%) prefer democracy over a leader with a strong hand, while far fewer in Kyrgyzstan (32%) say the same. In Southern and Eastern Europe, support for democracy is much higher among Muslims in Kosovo (76%) and Albania (69%) than in Bosnia-Herzegovina (47%) and Russia (35%), where a majority of Muslims favor a powerful leader. Views about the better type of government differ little by frequency of prayer, age, gender or education level. Muslims generally say they are very free to practice their religion. Most also believe non-Muslims in their country are very free to practice their faith. And among those who view non-Muslims as very free to practice their faith, the prevailing opinion is that this is a good thing. Muslims in Southeast Asia, South Asia and sub-Saharan Africa are particularly likely to say they are “very free” to practice their faith. Roughly seven-in-ten or more Muslims in each country surveyed in these regions hold this view. There is more variation in the Middle East-North Africa region, where Muslims in Iraq (48%) and Egypt (46%) are much less likely than Muslims in Lebanon (90%) and Morocco (88%) to believe they are able to practice Islam very freely. Muslims in Uzbekistan (39%) are the least likely among the Muslim populations surveyed to say they are very free to practice their faith. Muslims in Central Asia and the Middle East and North Africa are generally less likely to believe non-Muslims can practice their faith freely. Fewer than half in Kyrgyzstan (48%), Tajikistan (47%) and Uzbekistan (26%), for example, say others are able to practice their faith openly. Similarly, in the Middle East-North Africa region, fewer than four-in-ten Muslims in Iraq (37%) and Egypt (31%) believe non-Muslims are free to practice their religion. In 15 of the countries surveyed, Muslims are significantly more likely to say they themselves are very free to practice their religion than to say the same about people of other faiths. The gaps are particularly wide in Jordan (-22 percentage points), Kyrgyzstan (-20), Turkey (-20) and Egypt (-15). Overall, Muslims broadly support the idea of religious freedom. Among Muslims who say people of different religions are very free to practice their faith, three-quarters or more in each country say this is a good thing. Compared with support for democracy and religious freedom, sharper regional differences emerge over the question of the role of religious leaders in politics. The prevailing view among Muslims in Southeast Asia, South Asia and the Middle East-North Africa region is that religious leaders should have at least some influence in political matters. By contrast, this is the minority view in most of the countries surveyed in Central Asia and Southern and Eastern Europe. With the notable exception of Afghanistan, fewer than half of Muslims in any country surveyed say religious leaders should have a large influence in politics. Support for religious leaders having a say in political matters is particularly high in Southeast Asia. At least three-quarters of Muslims in Malaysia (82%) and Indonesia (75%) believe religious leaders should influence political matters, including substantial percentages who say they should play a large role (41% and 30%, respectively). In South Asia, a large majority in Afghanistan (82%) and Bangladesh (69%) believe religious leaders ought to influence political matters, while 54% of Pakistani Muslims agree. Afghan Muslims are the most likely among the populations surveyed to say religious leaders should have a large influence on politics (53%), while roughly a quarter of Muslims in Pakistan (27%) and Bangladesh (25%) express this view. In the Middle East-North Africa region, a majority of Muslims in most countries surveyed say religious leaders should play a role in politics. Support is highest among Muslims in Jordan (80%), Egypt (75%) and the Palestinian territories (72%). Roughly six-in-ten in Tunisia (58%) and Iraq (57%) agree. Lebanese Muslims are significantly less supportive; 37% think religious leaders should have at least some role in political matters, while 62% disagree. In each country in the region except Lebanon, about a quarter or more say religious leaders should have a large influence on politics, including 37% in Jordan. Muslims in Southern and Eastern Europe and Central Asia tend to be less supportive of a role for religious leaders in political matters. Only in Russia does a majority (58%) believe religious leaders should have at least some influence. Meanwhile, Muslims in Kyrgyzstan are divided over the issue (46% say religious leaders should have an influence on political matters, 51% disagree). In the other countries surveyed in these two regions, fewer than four-in-ten Muslims believe religious leaders should have a role in politics. 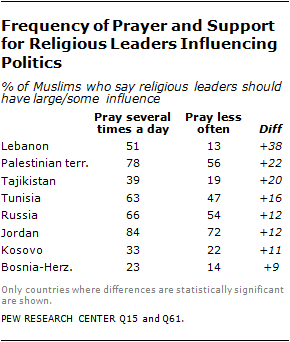 In some countries, Muslims who pray several times a day are more likely than those who pray less often to say religious leaders should influence political matters. The gap is particularly large in Lebanon, where 51% of Muslims who pray several times a day believe religious leaders should have at least some political influence, compared with 13% of those who pray less often. 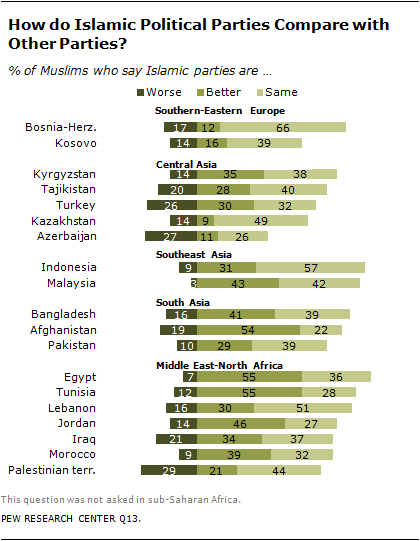 In most countries where the question was asked at least half of Muslims rate Islamic parties as better than, or about the same, as other political parties. The percentage of Muslims who say Islamic parties are better than other political parties is highest in Egypt (55%), Tunisia (55%) and Afghanistan (54%), although at least four-in-ten share this view in Jordan (46%), Malaysia (43%) and Bangladesh (41%). By contrast, fewer than a quarter of Muslims view Islamic parties more favorably than other parties in the Palestinian territories (21%), Kosovo (16%), Bosnia-Herzegovina (12%), Azerbaijan (11%) and Kazakhstan (9%). In all countries where the question was asked, substantial percentages of Muslims rate Islamic parties as the same as other political parties, including at least half in Indonesia (57%) and Lebanon (51%). Elsewhere, at least one-in-five rate Islamic and other political parties the same. 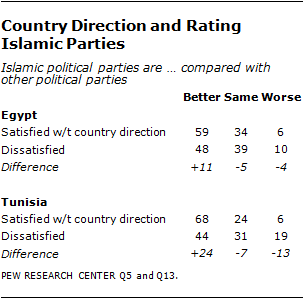 Relatively few Muslims consider Islamic parties to be worse than other political parties. Only in the Palestinian territories (29%), Azerbaijan (27%) and Turkey (26%) do more than a quarter subscribe to this view. In many countries, favorable assessments of Islamic political parties track with support for religious leaders having an influence on politics. In Lebanon, for example, Muslims who say religious leaders should have at least some political influence are 53 percentage points more likely than those who disagree to say Islamic parties are better (63% vs. 10%). In 15 of the other countries surveyed, similar double-digit gaps emerge over the question of Islamic parties, with those who support a role for religious leaders in politics consistently more favorable toward Islamic political parties. At least half of Muslims in 22 of the 36 countries where the question was asked say they are at least somewhat concerned about religious extremist groups in their country. In most countries, Muslims are much more worried about Islamic extremists than Christian extremists. Substantial proportions in some countries, including countries surveyed in the Middle East and North Africa, express concern about both Muslim and Christian extremist groups. The survey finds widespread concern about religious extremism in Southeast Asia, South Asia and the Middle East-North Africa region. In nearly every country surveyed in these regions, at least half of Muslims say they are very concerned or somewhat concerned about extremist groups. In Indonesia, nearly eight-in-ten Muslims say they are worried about religious extremism (78%), including more than half (53%) who are worried about Islamic extremists. In Malaysia, too, a majority of Muslims (63%) are worried about extremist groups; however, more Malaysian Muslims express concerns about Christian than Muslim groups (31% vs. 8%). In the Middle East-North Africa region, on balance, Muslims are more concerned about Islamic than Christian extremist groups, but more than one-in-five in most countries surveyed in the region are worried about both Islamic and Christian groups. At least half in nine of the 16 countries surveyed in sub-Saharan Africa also say they are concerned about religious extremism. And in most countries, Islamic extremism rather than Christian extremism is the principal worry. For example, in Guinea Bissau, more than half of Muslims (54%) say they are at least somewhat concerned about Islamic extremist groups; in Ghana 45% say the same, as do roughly a third of Muslims in Djibouti (36%), Chad (33%), Kenya (33%) and Niger (32%). In Southern and Eastern Europe, worries about religious extremism are most widespread in Bosnia-Herzegovina, where more than six-in-ten (63%) are at least somewhat concerned about religious extremist groups, including 27% who are specifically concerned about Islamic extremists. A similar proportion of Muslims (30%) in Bosnia-Herzegovina are worried about both Muslim and Christian groups in the country. Fewer than half say they are very or somewhat concerned about religious extremist groups in Russia (46%), Kosovo (45%) and Albania (21%). In Central Asia, the percentage of Muslims concerned about religious extremism ranges from roughly six-in-ten in Kazakhstan (63%) and Kyrgyzstan (62%) to fewer than one-in-ten in Azerbaijan (6%). In most of the countries surveyed in the region, worries about Islamic extremists are more common than are concerns about Christian extremists, although one-in-five in Kyrgyzstan are concerned about extremists of both faiths. In most of the 21 countries where the question was asked few Muslims endorse suicide bombing and other forms of violence against civilian targets as a means of defending Islam against its enemies. But in a few countries, substantial minorities believe suicide bombing can be often justified or sometimes justified. Muslims in some countries surveyed in South Asia and the Middle East-North Africa region are more likely than Muslims elsewhere to consider suicide bombing justified. Four-in-ten Palestinian Muslims see suicide bombing as often or sometimes justified, while roughly half (49%) take the opposite view. In Egypt, about three-in-ten (29%) consider suicide bombing justified at least sometimes. Elsewhere in the region, fewer Muslims believe such violence is often or sometimes justified, including fewer than one-in-five in Jordan (15%) and about one-in-ten in Tunisia (12%), Morocco (9%) and Iraq (7%). In Afghanistan, a substantial minority of Muslims (39%) say that this form of violence against civilian targets is often or sometimes justifiable in defense of Islam. In Bangladesh, more than a quarter of Muslims (26%) take this view. Support for suicide bombing is lower in Pakistan (13%). In the countries surveyed in Central Asia and Southern and Eastern Europe, fewer than one-in-six Muslims consider suicide bombing justified in Turkey (15%), Kosovo (11%) and Kyrgyzstan (10%). Elsewhere in these two regions, even fewer say this tactic can be justified. In Southeast Asia, Malaysian Muslims are more likely than Indonesian Muslims to consider suicide bombing justifiable (18% vs. 7%).